Minister for Public Expenditure and Reform, Paschal Donohoe TD, has today (Wednesday) signed up for his Public Services Card (PSC) at D’Olier House in Dublin. In doing so, Minister Donohoe called on all those over the age of 18 who have not yet signed up for a PSC to do so at their earliest convenience. 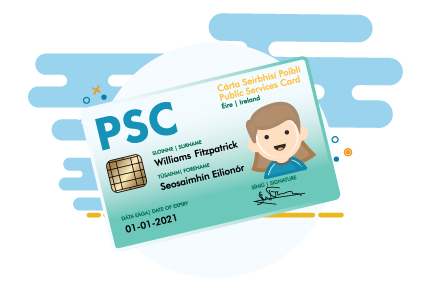 The Public Services Card (PSC) is designed to assist people in accessing a range of Government services. Initially, this focused on social welfare payments such as Child and Jobseekers’ Benefit, as well as the Free Travel Pass and State pensions. However, over time, it is being rolled out to other public services and will become the means by which access to public services will be verified and delivered in Ireland. There are already in excess of 2 million PSC card holders across the State, with the end goal being the issuing of a total of 3 million cards (to cover the entire population 18+). Application for a PSC is via face-to-face registration using the SAFE (Standard Authentication Framework Environment) registration process*. This is designed to establish and authenticate an individual’s identity for future access to public services, allowing individuals to gain access to public services without having to give the same information to multiple organisations. This process also ensures that a person’s privacy is preserved to the maximum extent possible. Currently almost 12,000 customers are being SAFE registered every week. Minister Donohoe said: ‘The Public Services Card acts as a key to more efficient and better-run public services. It enables the State to provide new and enhanced services to the public while also achieving efficiencies in administration and helping to eliminate fraud. The PSC is being rolled-out across our public services, with the technology contained within the card providing for the elimination of the duplication of identities or multiple benefit claims being made by individuals’. “The PSC is already an accepted form of photo identity for electoral purposes and all SUSI grant applicants and first-time adult passport applicants must now be SAFE registered. The Road Safety Authority and the National Treasury Management Agency are also developing plans for the process to support new drivers’ license applicants and proof of identity for State Savings purposes. Work is also ongoing to establish how it might replace the Garda Age card in the future. ** The SAFE authenticated identity data can be made available to other public service providers, thus negating the need for the repeated capture and validation of identity data in respect of the same individual. This benefits the public and also means that public sector organisations can become more efficient and save costs. The photo-matching software is an essential element of the process and has led to success in tackling multiple claims fraud, resulting in a number of convictions in Court with other prosecutions pending, and substantial savings to the taxpayer (minimum €2.1m to date).